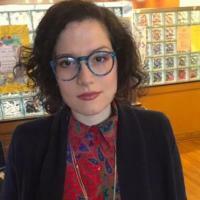 Laura Jaramillo is doctoral candidate in the graduate program in Literature specializing in cinema and media studies and Latin American and Peninsular Studies. Her research broadly investigates the relationship between novel aesthetic forms, the senses, and politics, from modernism to the present. Her current research examines the aesthetics and politics of ritual in 1968-era Latin American and Spanish avant-garde cinema. Analyzing works by Chilean cult filmmakers Alejandro Jodorowsky, Spanish inventor and mystic José Val del Omar, and Cuban ICAIC co-founder Manuel Octavio Gómez, she explores how ritualistic aesthetics and practices of viewing emerge as forms of resistance during times of accelerating historical trauma. In addition to her scholarly work, she is a poet and a film critic. Her poems have appeared in publications throughout the U.S., Latin America, and Europe. She writes on contemporary film and video for Durham's INDYweek. My research currently focuses on the intersection between technology and magic in the films of Spanish inventor and mystic Jose Val del Omar and Chilean cineaste Alejandro Jodorowsky during the transition to neoliberalism in the late 1960's.